K3 Telecom Sierra Leone limited is poised to provide super speed internet service to customers with their revolutionary technology and a new way of watching television content. As a subsidiary of K3 Telecom AG in Switzerland, the company yesterday announced the start of their ISP with triple-play services in Freetown on their own wireless broadband telecommunications network. He said even though Freetown will be the starting point of their operation, they have plans to expand it to other parts of the country in the coming months. “We are entering the market with attractive packages that will start at a price of $99. We don’t want to be the cheapest ISP provider but we want to be the provider with the best in terms of price and quality,” he assured. 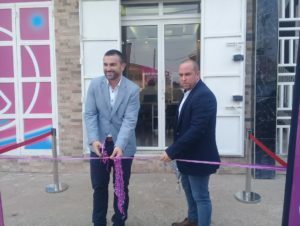 Also, CEO of K3 Telecom AG, Uros Mlakar stated that the ISP services offered in Freetown are comparable to the fixed services known in Europe and American markets. “Internet will be extremely fast and uncapped already in basic packages, allowing for carefree communication, emailing and using video services,” he said and assured that in the coming months, their network will be further upgraded and expanded to increase the range of their signal. Also, Mr. Mlakar disclosed that at the same time with internet, there is a television coming with more than 100 channels and with an entirely new way of watching television content called Next Smart TV. He added that the digital program will provide extended insight into the television program scheme and contents.